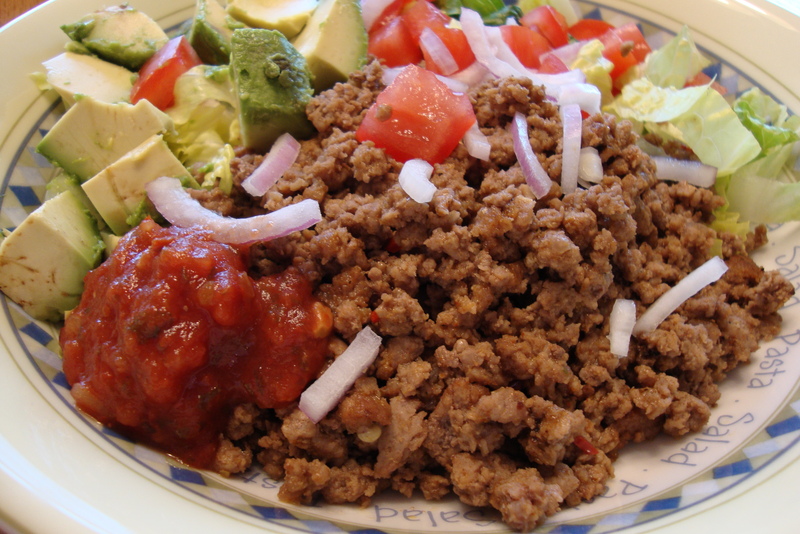 Taco salad will satisfy your Mexican food cravings! We love Mexican food. In our pre-primal days, taco night was part of the regular rotation. Since we no longer partake of corn products, we had to be a little more creative with taco night. It’s now taco salad night. Store bought spice mixtures are full of not so good for you ingredients and they are more expensive then making your own. The recipe below is for one pound of ground beef, but you can easily double or triple the spice mixture for larger quantities. Top with your favorite taco fixings and enjoy! Mix together all of the above ingredients. The spices will make one pound of taco meat. Brown one pound of ground beef in a frying pan. Drain the beef and return the pan to the stove over medium heat. Add 1/4 cup of water and the spice mixture. Stir well to combine with the beef. Simmer for 3-5 minutes or until most of the liquid has evaporated. Serve over a bed of romaine lettuce with your favorite taco fixings (avocado, salsa, tomatoes, onions, sour cream, cheese, hot sauce). Great! I’m glad you liked the recipe!